Staff Selection Commission or SSC has been one of the most desirable organizations for Government exams in India. Every year thousands of vacancies are filled by SSC in Government departments. Govt. jobs are the most sought after career choice in India. More so, the government is focusing on providing better facilities and services in every aspect of our lives. Govt is focusing on the development of our country and to do that millions of Jobs will be created in the coming years. SSC is the leading Govt. organization that provides employment to lakhs of students in India. A great opportunity lies ahead for all the SSC aspirants. The SSC CGL notification for 2017 is scheduled to be published on May 16th, 2017 by the governing body and will be updated on this website. Keep checking this page for more information. The Central Government has announced that they will hire as many as 2.2 Lakh people from March, 2015. Out of these a maximum of 70,000 vacancies, will be created in Income Tax, Excise and Customs Department. Approximately 14 lac candidates appear for the SSC CGL exam every year. The SSC CGL Exam 2016 had an initial count of 4500 to 5000 vacancies. However, the number of vacancies was increased to 9000 later. For 2017 CGL Exam, the expected number of vacancies may be more than 30,000, given a slew of hiring in the Income Tax Department. The tentative schedule for the SSC CGL 2017 exam is as follows. Please note down the important dates related to SSC CGL Exam 2017 and make sure to complete the process in time. 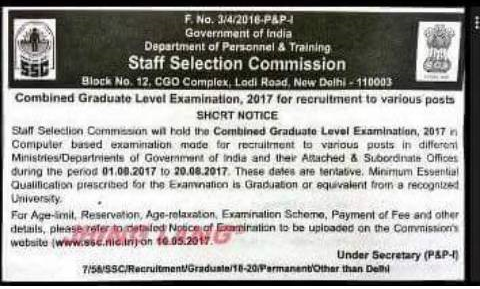 The Staff Selection Commission (SSC) conducts the Combined Graduate Level (CGL) Exam for the recruitment of Grade “B” and “C” category posts in various Government Ministries, Departments and Offices. The exam is held in 4 stages called Tiers. While the first two are online the latter two are offline exams. The entire process of registration and communication happens online through the official website of SSC CGL. Candidates must qualify each stage of the SSC CGL exam to proceed to the next one, before being finally selected. • SSC CGL 2017 Tier 1 and Tier 2 exam will be conducted in online mode. • Introduction of a descriptive paper of 100 marks within 60 minutes in pen and paper mode. • Reduction in time limit for examination of Tier -I from 120 minutes to 75 minutes. • Tier II will remain same. • No Sectional Cut off. Since the SSC CGL is comprised of 4 different levels, we must deal with their syllabus independently. • The exam duration is 100 minutes for candidates who are visually handicapped. • There is negative marking in SSC CGL 2017 Tier 2 exam. Giving a wrong answer to a question will lead to a penalty of 0.5 marks in Paper-1,3,4 and 0.25 marks in Paper-2. • Questions in Paper-I will be of 10th standard level, Paper-2 of 10+2 level and Paper-3 & 4 of graduation level. • The computer will be provided by the Commission at the Centre/venue notified for the purpose. Candidates shall not be allowed to bring their own Key-board. • The exam duration is 2 Hours and 40 Minutes for candidates who are visually handicapped. This is a descriptive exam that is designed to test the written skills of the candidates in English/Hindi. It is conducted offline and candidates need to write Essay/Letter/Application/Precis. The best way to prepare for the same is to read lots of articles from various newspapers. Apart from this, you need to be well aware of the pattern of Letter and Application. • The exam is of 60 minutes’ duration and carries 100 marks. • The questions are based on 10+2 level. • The exam is qualifying in nature. • The exam duration is 80 minutes for candidates who are visually handicapped or suffer from cerebral palsy. The Tier 4 of SSC CGL Exam 2017 comprises of a couple of skill tests which are required for certain government posts. 1. DEST (Data Entry Speed Test): This skill test is of qualifying nature for all the posts, other than Compiler, and is used to check the typing speed of the candidate. The candidates are given printed matter in English which they must accurately type on a computer with a minimum of 2000 (two thousand) key depressions in a duration of 15 (fifteen) minutes. 2. CPT (Computer Proficiency Test):The Commission will hold CPT, comprising three modules - Word Processing, Spread Sheet and Generation of Slides, for applicants for the post of Assistants of CSS. CPT will be of a qualifying nature. SSC CGL exam preparation must be done in a systematic manner, with latest exam pattern in mind. Since the syllabus covers a lot of topics, it is important to choose the right study material so that you can understand the concepts and practice a wide variety of questions as well. Apart from self study you can join any Coaching and Online Test Series for better exam preparation. Every candidate who registers for SSC CGL Exam 2017 within stipulated time will be assigned an e-admit card/hall ticket/call letter that can be downloaded from the official website of SSC. The admit card for the CGL Tier-1 exam will be released first followed by the admit card of CGL Tier-2 exam (administered to only those candidates who qualify for Tier 1 exam). More information and the download link for the admit card will be displayed post the release of the official notification for SSC CGL 2017. Candidates are advised to keep checking this page for updates. Staff Selection Commission (SSC) will release the results in four stages after completion of each Tier Exam. The candidates selected in the rounds progress to the next one. Candidates can check the result from the direct link to official SSC CGL website as and when the results are announced. The official answer key to the SSC CGL Tier-1 exam is released by Staff Selection Commission within 10 to 15 days of the successful completion of Tier-1 exam. Candidates can use the answer key to calculate their approximate marks and expected ranks in SSC CGL Tier-1 exam.